Google AdWords continues to introduce new tools and options to better target your market and their new “Interest Categories” feature is a welcomed addition. Instead of targeting websites or keywords that you think your target audience would be interested in, Interest Categories flip the process on its head and focus on the interests of the audiences. For example, if you wanted to target young adults who ride dirt bikes. 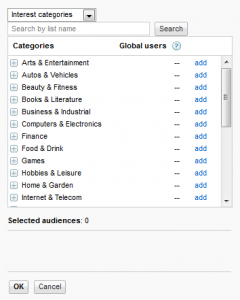 With interest categories you can place ads in front of highly customized audiences even when they are visiting websites that are not associated with the category you’ve selected. By reaching highly targeted people even when they are not visiting websites related to your interest category it allows you to increase the reach and frequency of your advertising. This is especially beneficial if your target audience belongs to a sub-set of many different interest groups. When people visit any of the millions of websites that use Google AdSense to display ads, Google analyzes the content of the page and site to show ads that match the content. Google uses this information along with third-party cookies to analyze the visitor’s interests. It takes into account the types of sites, frequency of visits to infer gender, age group, and other demographics. For example, if you visit sites that have a majority of male visitors, it may associate you with a male demographic category. I would recommend creating separate campaign just to handle your interest category campaigns. Make sure that Display Network is selected under the “Networks” setting for the campaign. Automatic bidding with a Max CPC. We suggest starting with automatic bidding — Google will automatically adjust your bids to get the most clicks possible from your budget. You can set a max CPC to control the cost of individual clicks. When you’re done, enter your daily interest categories budget in the Budget section. The work-horse of Interest Categories is the ability to use AND/OR/NOT options to create highly customized interest groups, you can create unique campaigns for a variety of customers. This is a very narrow sampling of interest groups that would identify youth culture and give FOX and ATVsafety the ability to create targeted campaigns just for that group.